Glamorgan wicketkeeper Mark Wallace has backed his former county team-mate Jason Gillespie for the vacant England head coach role. 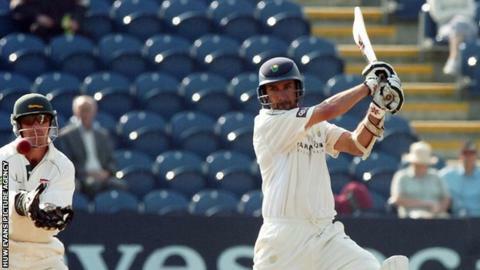 Former Australian fast bowler Gillespie, 40, who played for the Welsh county in 2008, currently coaches Yorkshire. He is to hold talks with England director Andrew Strauss about the vacancy. "I think he'd [Gillespie] be a very good England coach," said Wallace. England want a successor to sacked coach Peter Moores before the Ashes. Gillespie has emerged as front-runner for the role having led Yorkshire to the County Championship title last year. The Australian told BBC Sport on Tuesday that he would "take persuading" to leave the county. "It's no surprise that Dizzy [Jason] Gillespie has done so well in his coaching career with Yorkshire so far," said Wallace. "He's very laid back and very much a players-first kind of guy. "You talk to the guys at Yorkshire and they absolutely love him. "Maybe it's a bit harsh on Peter Moores, the cards he was dealt over his two terms, but now they've moved on from him, Dizzy would be a pretty good replacement." Wallace says if appointed Gillespie's love for heavy rock music will help him cope with the pressure and spotlight put on the England job. "Not much tends to bother Diz," said Wallace, "he'll just put the headphones on, listen to a bit of Metallica and let it all wash over him."